While the gap between upper middle-class Americans and the working poor widens, grueling low-wage domestic and service work--primarily done by women--fuels the economic success of the wealthy. Stephanie Land worked for years as a maid, pulling long hours while struggling as a single mom to keep a roof over her daughter's head. In Maid, she reveals the dark truth of what it takes to survive and thrive in today's inequitable society. While she worked hard to scratch her way out of poverty as a single parent, scrubbing the toilets of the wealthy, navigating domestic labor jobs, higher education, assisted housing, and a tangled web of government assistance, Stephanie wrote. She wrote the true stories that weren't being told. The stories of overworked and underpaid Americans. We are extremely excited to be hosting Stephanie Land at the Holter Museum of Art on February 23! 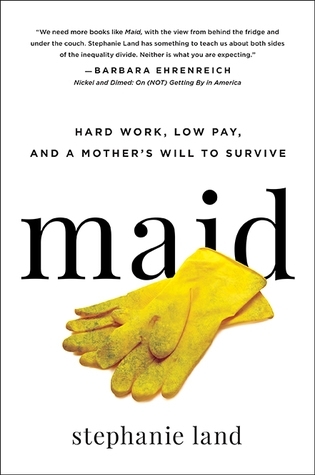 Join us for a discussion about Land's debut book, "Maid: Hard Work, Low Pay, and a Mother's Will to Survive." A talk at 2:00 will be followed by a Q&A session and a signing.